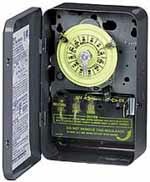 This heavy duty mechanical time switch is designed for industrial, commercial and residential applications. This time switch has the highest horsepower ratings in the industry for loads up to 40 amps resistive from 120 to 480 volts providing direct 24 hour time switch control of most loads. This series provides 1 to 12 "ON/OFF" operations each day with minimum ON/OFF times of 1 hour.